I talk to each of our girls most every day. And though our topics of conversation vary from one day to the next... both in length and scope... they always seem to be peppered with one thing: some mention of food. What can you do with a can of beans, one zucchini, some wilting kale, and a few asparagus spears that have seen better days? What's the quickest thing you can think of to make for dinner... I'm at the store right now? While there's no guarantee they'll take my advice, I always attempt to offer something up. And a frittata is a great, all-around go-to meal for pretty much any challenge... assuming you have some eggs. 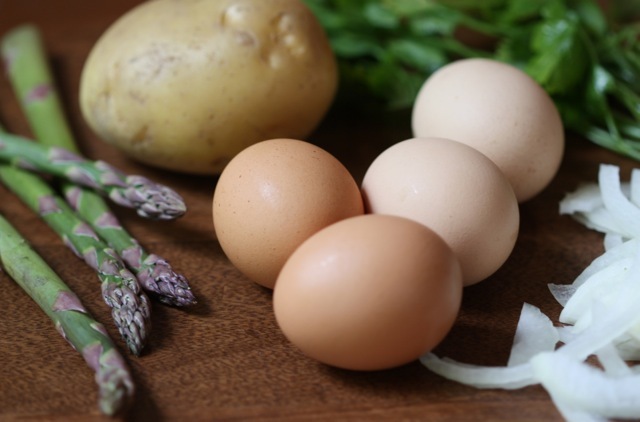 A lot of people shy away from frittatas (egg pancakes, tortas, whatever you want to call them) because recipes often call for half a dozen eggs (or more) and, in the case of a Spanish torta, a whole heap of potatoes. This isn't particularly conducive if you are cooking for just one or two. However, a good frittata is really just a function of selecting the right size pan. A small, six-inch skillet, a couple of eggs, and a single potato can make a great meal. Or... you can feed a whole troop with a large skillet, a bunch of eggs, and several taters. It's a quick meal either route you go. Best of all, you can chop and drop most anything you want into the mix... which makes this a great way to clean out the fridge. 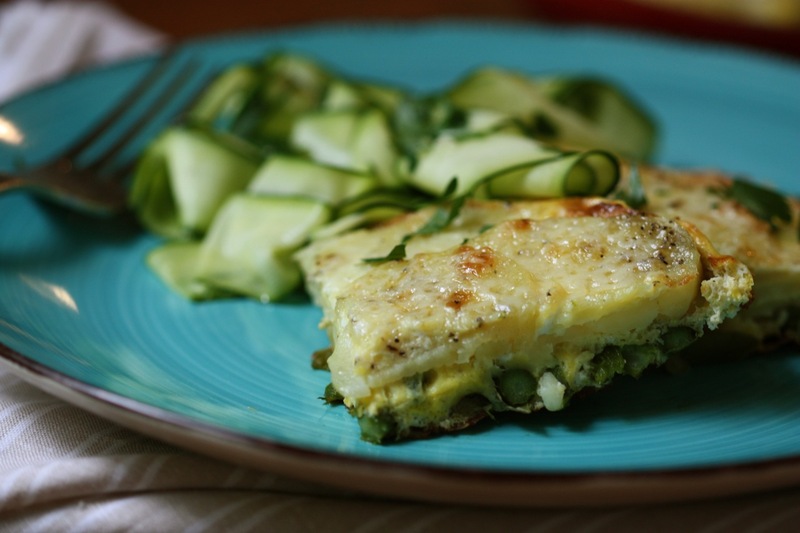 For this meal, it's a quick dinner for two (or one, with leftovers)... a thin, potato-asparagus-gruyére cheese frittata with a fresh zucchini salad alongside. A great, go-to dinner... particularly perfect if you want to use up that last bit of asparagus... or find yourself wandering the aisles after work, tired, hungry and in need of a plan... just saying. The greatest thing about frittatas is you really can't go too wrong. Add more eggs and potatoes, change up the veggies, mix up the seasonings (salsa, peppers, mushrooms, sausage, whatever)... it's all good. You can make them to serve just one or two... more delicate and thin, perhaps, but still with a lot of flavor. 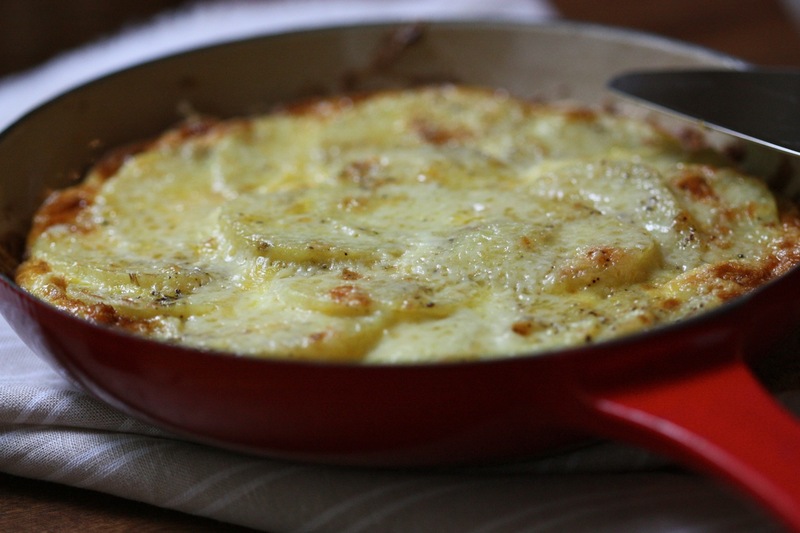 Or you can pile them up, with beautiful layers of thinly sliced potatoes, and serve a whole crew. And... you can baby them over the stove, slowly cooking the egg through and pop them into the oven for a quick finish... or, like I did on this particular outing, give it all a quick start on the stove and let the oven do most of the work. You'll have a bit of variation on how it will rise... but truly not enough to compromise your plans for a quick and easy effort. Just pick a pan and go. Parboil potatoes in a pot of lightly salted water... for approximately 3 to 5 minutes. Potatoes should be fork tender but not falling apart. Drain and set aside to cool. In a bowl, lightly toss zucchini and parsley with a drizzle of olive oil and a good squeeze of fresh lemon. Season with salt and pepper, to taste. Set aside. Meanwhile, in a small, oven-safe skillet (I used a 6"skillet), sauté onions in olive oil and butter until just beginning to appear translucent (about 2 minutes), then add asparagus and continue cooking for another minute or so. Add just 1/4 cup of your egg mixture to pan and about 1/3 of the shredded cheese (this will give potatoes something to sit on) . Reduce heat to low and layer potatoes concentrically around edge of pan, working your way inward until all slices are used. Sprinkle with just a bit of salt and pepper, and remaining 2/3 cheese. Transfer skillet to oven and bake for approximately 10 to 12 minutes. Remove from oven, set oven temp to broil, and transfer skillet to top rack when broil temp is reached for just a few minutes, depending on how golden you want your frittata... watch it closely. Serve immediately with zucchini salad alongside.